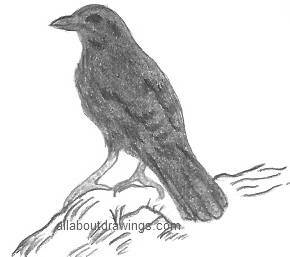 Pick up your pencil and start creating some drawings of ravens today. 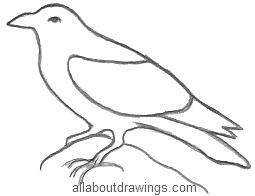 If you have never done a raven drawing before, the best place to begin is by copying an outline like the one provided below. I drew this outline and all the images displayed here after one year of teaching myself to draw. The more you practice, the better you become, so I have grand aspirations of improving even more on this current style. It also depends on how much time you can devote to drawing and this is a stumbling block for most of us. I always worry that I will lose ground with my progression when I don't practice consistently but I usually pick up where I left off without too much drama. Don't let time shortage deter you, just draw whenever you're able because you can derive just as much pleasure in short spurts! In order to achieve a good resemblance with your drawings of ravens, you need to know a bit about the subject. If you believe in myths and legends, ravens are said to be magical birds so keep that interesting fact in mind while you draw because it helps wake up the creative artist inside of you. A raven is a bird that belongs to the crow family. I think we all worked that one out! There are some minor differences between the two birds so you need to know these little details. A raven is bigger than a crow. 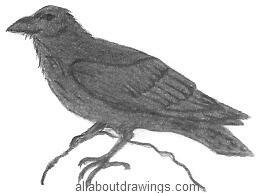 It has a larger beak and it's tail is wedge shaped whereas a crow's tail goes straight across. A raven's wings can span three feet wide. Both birds have strong bills and are very loud and vocal. ...the feathers have a purple sheen, on the belly there is a dull green tinge and also there's a bit of grey around the neck. So when you do drawings of ravens and you wish to color them, remember to include purple, green and grey. We describe people with unusually dark, shiny black hair as having raven hair. Because the raven is black, it is thought to bring bad luck. Ravens are not popular because they eat young birds or the eggs. However, they do consume lots of insects and pests which ultimately helps our farmers. Remember I mentioned that ravens were involved in myths and legends? Well, the story goes that The Norse God Odin had two ravens that sat on his shoulders each night detailing what they witnessed happening on his land during their daily flights. Ravens were also mentioned as black birds in the nursery rhyme 'Sing a Song of Sixpence'. Oh wasn't that a dainty dish to set before the king. Remember that? Yes, it appears they do have quite a history. I did my drawings of ravens with a 2b pencil and I used a 9b for shading. Both of those grades are included in my favorite Derwent Pencil Set. Have you tried to do a raven drawing yet? All you have to do is give it a try, you probably won't like your first attempt, but keep going, I promise you will improve. If you don't like to copy straight onto your paper just by observing, you can try to look for shapes in the bird and go from there. Do a small circle for the head and a larger oval shape for the body, then join the circles together with your contour lines. Work with it until you think you have the correct shape. To be successful, keep working on your raven sketch, date it, number each attempt, and step back to admire your good work. Whenever I tackle a particularly hard subject, I always number every image to gauge how much I improve with each one. These drawings of ravens didn't scan very well. I think the 9B shading is too heavy so next time I'll just stick with 4B pencils -- it's all a learning curve but I still enjoy every minute which is exactly what I want you to experience. Go on, get your pencils out now, there is no time like the present to have fun!